"This is a very important parade and a very meaningful parade given the tragedy and the devastation of the homeland." 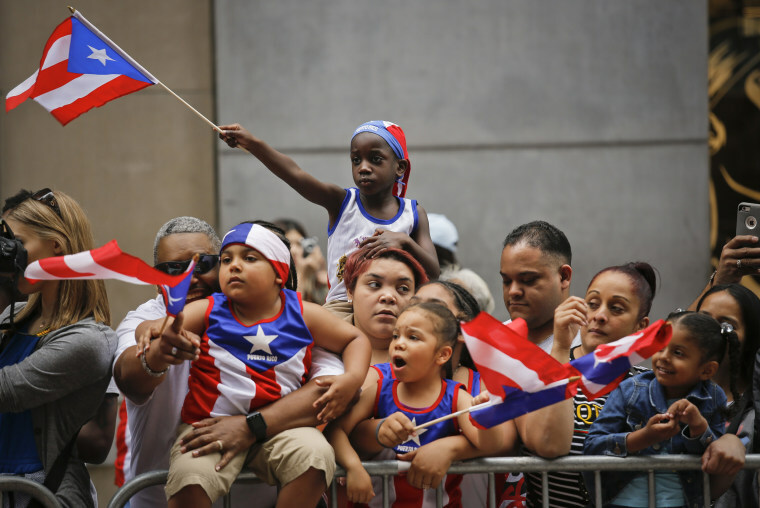 On Sunday, hundreds of thousands of participants and spectators gathered in New York City for the 61st National Puerto Rican Day Parade. Yet amid floats, flags, celebrity sightings and music, the traditional event has taken on a special significance — it's the first parade since Hurricane Maria's massive destruction of the island. Nitza, who drove from New Jersey early this morning, was one of the many people that lined up along Manhattan's Fifth Avenue in order to get a good spot right at the beginning of parade. Under this year’s main theme “One People, Many Voices,” the parade honors Puerto Ricans whose work enriches the culture while paying tribute to those who are working to rebuild and strengthen the island after Maria. “This is a very important parade and a very meaningful parade given the tragedy and the devastation of the homeland,” said Louis Maldonado, National Puerto Rican Day Parade (NPRDP) Board Chair, at a pre-parade event on Friday. The parade featured many cultural elements from the the island’s folkloric culture such as vejigantes, jíbaros and some bomba y plena while also highlighting Puerto Ricans' contributions to the New York City workforce. Floats with city workers, law enforcement, teachers and others were embracing their so-called 'Boricua Pride.' Amid these, many floats displayed the number 4,645 in reference to a Harvard study that estimated over 4,000 deaths during the aftermath of Hurricane Maria. Amid such bittersweet sentiments and the drips of rain, parents like Joel Pacheco felt that more people attended the parade this year. “Everybody is out here today and they’re up for a great time,” said Pacheco while holding his toddler son Jeremiah. This year, with the help of the Hispanic Federation, the parade's organizers are embarking on an effort to inject much-need funding to the island's small businesses. Google is matching donations made through their philanthropy page — up to $2 million, and all the money will go to helping small businesses in Puerto Rico, a sector that employs about 90 percent of the island’s workforce, according to Hispanic Federation founder Luis Miranda. Brooklyn-born Puerto Rican actor Esai Morales is leading the march down Fifth Avenue as the parade's Grand Marshal. “My passion and my pride is very much connected to that tiny little island with a big heart, which did not receive the kind of support that we have hoped would be sufficient. Nonetheless, it did get the world’s attention," said Morales, known to many for his roles in movies like La Bamba and TV shows like NYPD Blue and HBO's The Brink; his upcoming film, Superfly, comes out in theaters June 13th. “I just offer my respect, my condolences to the thousands of uncounted that died, as a result of the inability to provide basic services, and my heart goes to their families." Some prominent Puerto Ricans who are honored this year include baseball great Jorge Posada and his wife Laura, who are the event's "padrinos" or godparents. The Posadas have donated and raised over half a million dollars of much-needed medical supplies and relief to the island. Other honored include the legendary Puerto Rican singer Lucecita Benítez and salsa singer Ismael Miranda. While using the parade’s spotlight to call for more action to help Puerto Rico, organizers are honoring a new generation who have used their art and talent to redefine what it means to be Puerto Rican. Receiving this year’s ‘Rising Stars’ honors are Christopher Rivera, who won Telemundo’s La Voz Kids in 2016, and motivational speaker Sebastián Rosado. Rivera turned 16 just four days before Hurricane Irma ransacked Puerto Rico; a week later, Hurricane Maria happened. Like hundreds and thousands of Puerto Ricans, he temporarily moved to Florida where he finished 11th grade. “I think this parade is a great space for those Puerto Ricans living in the U.S. to feel some sense of relief after being so worried about us these past months,” Rivera told NBC in Spanish. For Sebastián Rosado, whose motivational speeches highlight his experiences as a cerebral palsy patient — a congenital condition that affects his body movements and coordination — the parade gives him the perfect stage to continue to spread his message about perseverance. “I overcome all the barriers that come my way,” said Rosado, who in 2015 made history by becoming the only athlete with spastic quadriparesis to finish a 5K race. Rosado participates in a 5K race every year to raise funds for a center in Puerto Rico that runs a summer camp for youth with special needs. After Hurricane Maria, Rosado was forced to do a different 5K race in Miami last year. “I remember people would tell me, 'Sebastian, go! You can do it! 'And I think that's exactly the mentality that people in Puerto Rico need to have to continue to do their best and rebuild Puerto Rico," said Rosado. Musicians Luis Sanz, Fabiola Mendez and Maribel Delgado are among this year’s parade ambassadors. They represent a new generation of musicians who play the Puerto Rican cuatro, the island’s national instrument, keeping the musical tradition alive. “The cuatro is like the voice of our people, no matter the circumstances, the hurricanes, it still stands,” said Sanz, who played his cuatro at the Latin Grammys last year with artist Residente. “It is also the instrument that represents our fight,” said Mendez, who is the first student from the University of Berklee in Boston to graduate with the cuatro as their principal instrument. “Although we’ve seen new genres and tendencies surface, it's legacy still persists. It symbolizes the persistence and the resistance that characterizes the spirit of the Puerto Rican identity." Vanessa Guillen Matheus contributed to this report.